『강세황 행초 표암유채(姜世晃 行草 豹菴遺彩)』첩은 표암 강세황(1713~1791)이 1790년 겨울에 송나라 양시(楊時) 등의 칠언시를 행초로 쓴 것이다. 말미에 우리나라 남쪽에서 생산되는 죽청지(竹淸紙)에 관한 기록은 조선후기 18세기 말의 종이에 관한 소중한 기록이다. 오늘날 강세황의 필적으로 서첩ㆍ간찰ㆍ병풍 등이 다양하게 전하지만, 이 서첩처럼 연대와 내력이 분명한 예는 드물다. 더욱이 이 서첩은 그의 기년작 가운데 가장 말년에 해당하는 절필(折筆)로서 강세황 특유의 완숙한 서풍을 보여준다. This album titled Pyoam yuchae contains calligraphic works by Kang Se-hwang (1713-1791, pen-name: Pyoam), dating from the winter of 1790. They are a series of seven-word poems composed by Song poet Yang Shi and others, written in semi-cursive script. 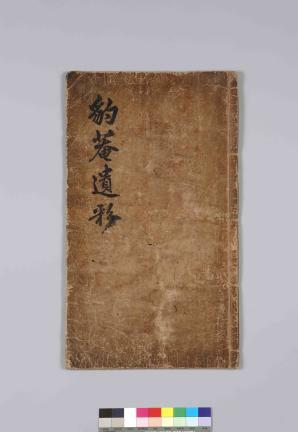 The information about jukcheong paper, found at the end of the album, is highly valuable for insights it offers into paper-making in Joseon, in the late 18th century. 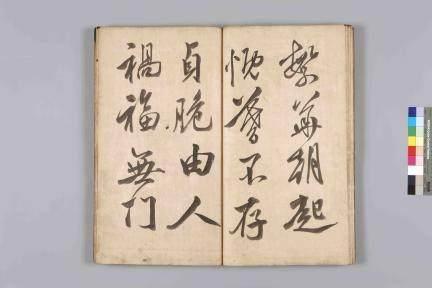 A good number of writing samples of Kang Se-hwang have survived to the present in various forms, including calligraphy albums, letters and folding screens. But, few of them have as clearly established dates and circumstances as this one. Meanwhile, the calligraphy works contained in this album are among his last works, dating from his later years, and display a level of maturity unprecedented in any other works of his, which makes this album even more valuable.